The B#SIDE WAR is an artistic and cultural festival of spread art, diffuse in 12 territories of Italy and Slovenia, thanks to artistic exhibitions and installations, performing, talks and conferences, researches and publications. The festival covers the area from the Mediterranean Sea to the Julian Alps, in addition, special events in Toronto (Canada), Kansas City (USA), Canberra (Australia), Verdun (France), Ieper (Belgium) and London (UK) take place every year. Designed with the main scope of investigating the legacies that connect the First World War to our everyday life, the B#SIDE WAR project has then been devoted to the analysis of the relationship between the Human Being and the ‘900 conflicts, as well as to the examination of the kinship between our war past and the vision of the world we nowadays have. The third edition of the festival will takes place thanks to the artistic and curatorial work of several contributors belonging 39 different country: 68 artists from all round the world, 17 national museum directors, 25 researchers, a team of 25 cultural organizers. Key themes for the third edition of the festival are: captivity, prisons, multi-vocal and poly-focal vision of history. For the opening (called "Venice Stage"), the art direction has involved the international artists Ana Mrovlje, Manca Bajec and Dan Allon, which will inaugurate the third edition creating a week of intense and unique performative acts, interconnected by a common necessity of re-reading the war stories the artists have experienced on their skin (the Israeli-Palestinian conflict, the war in the Balkans), or the war stories of which they are heirs (the first and the second world war). The Opening Week wants to involve the audience in exploring issues related to repression and inheritance of the conflict, entering into a contemplative space in which to undertake new interpretations and relive a necessary poly-focal and multi-vocal perception of war facts. Ana Mrovlje, author of the installation Peacestool (Sit Down and Deal with War Inside of You), artist who studied as psychoanalyst, investigates something that is still part of our collective memory, lying in the subconscious and in everyone's inheritance: the lagacy of war. A chair shaped with 3000 bullet shells from the World Wars coming from different countries, appears as a witness of conflicts that with their echo nowadays are able in influencing other wars (as the Balkan conflict, of which the artist was a witness). 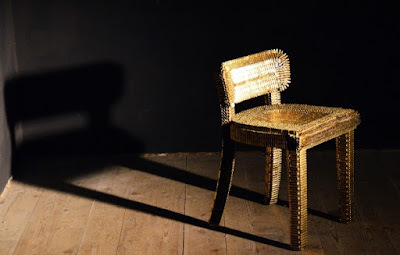 The chair evokes also the path of introspective investigation that the artist pursued, sitting in the studio of her analyst every week, questioning herself about war from a chair. Putting the visitor in the centre of the artistic action, he becomes the protagonist of a war that takes place intimately in his/her mind and that becomes collective again in virtue of its “silent presence” in each of us. a pluri-focal vision of history which still is a necessity today. In a vacant space animated by floating voices, querying the memory of the past, sounds and objects become carriers of the experiences people endured in war. The visitor will share universal symbols and emotions, being a witness of individual moments that have never been “monumentalised”. Than, the Israeli artist Dan Allon, who, in the performance All in Order Mr. General ponders upon the topic of repression, which is one of the principal instruments in the struggle for power. During the 7-day performance, the artist will step into the shoes of a dictator in captivity, imprisoned in a uneasy place, under everyone's eyes (being at the same time victim and executioner), creating a reverberation about some archetypal figures and re-elaborating the intense experience he lived as jailer in Kzioth (Israeli-Palestinian conflict). Being aware of the relationship between the most powerful and the weakest in societies in war, the artist sheds a light on the complex relation between the military and civil world that are divided, so in wars of yesterday as today, by a very thin line. The performance concerns the complexity and the ambivalence of history, creating relationships and tensions with the visitor, starting from the asymmetric relation that binds the visitor to the prisoner. the theme of memories and legacies of the the World Conflicts.